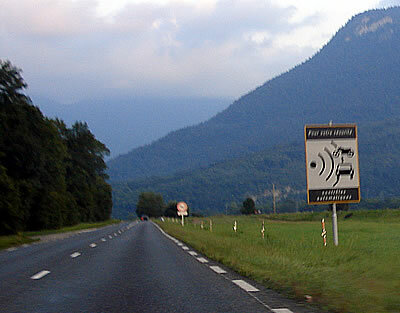 The warning sign for one of the fixed cameras between Lake Annecy and Ugine. The speed camera right near the French / Swiss A41 Autoroute border (entering Switzerland down the hill) seems to be very sensitive now some of the roadworks have been removed. From 01 May 2017 it has been widely reported that the DVLA will share UK Registration details with France and Switzerland and they will chase you for fines from cameras incurred while abroad. No real hard info on this yet - both the Swiss and the French have been chasing speeding fines from hire cars for a while (rather than just get the hire company to pay them plus an admin fee that they pass on to the customer) but if you don't pay they would appear to give up. Of course if you were pulled over speeding next time you visited you could be asked for the fine - they would have your licence details we suspect. What is unclear is the passing of passport information over to the authorities - surely the DVLA can't do this so there is no chance of you getting stopped at the border if you've unpaid fines? We'd be glad to hear of anyone who has real information on this rather than the tabloid tales of £640 fines for UK drivers etc. A new law aimed at tackling pollution requires all vehicles in Paris, Lyon and Grenoble to show a €3.70 (plus UK postage = €4.80) sticker on their windscreens - penalty for failure to display is up to £120. Note Paris refers to inside the A86, the outside long ring road - not the Périphérique, the inner ring road. Focus is on more mobile cameras in France and Switzerland - be careful if you're without English plates. Swiss fines being related to income now and can be ridiculous. The new law around carrying a breathalyser test kit came in on 01 July 2012 and originally was not going to be enforced until 01 November 2012 - it was then delayed until 01 March 2013. The latest information we have is that the enforcement has been put on hold indefinitely. They only cost around £6 for a twin-pack from Halfords. Roadworks continue (forever) around the approach to the departures area of Geneva Airport, and the main car parking areas on the surface is closed, make sure you get in the correct lane early. The illuminated red line (new last Winter) instead of a barrier where people come out of baggage reclaim continues to work amazingly well keeping everyone stood back! There is a new speed bump on the approach to Le Praz but one of the La Tania ones has been taken out. The road up to the chalets in La Tania was finally re-laid at the end of Summer 2012 and is in a much improved condition. Note the La Tania to Méribel Village D98 road is being rebuilt and expected to be closed in Summer for 2014, 2015 and 2016. Sunday night in August en-route to Lyon - I was pulled by 2 motorcycle Gendarmes about 5km before Albertville. Probably doing about 150km in the 130km limit, no idea where they were hiding but probably neat the bottom of the hill near there. I was fined €90 and needed to be escorted to a cash point as I only had 2 x €50 notes - they wouldn't give me change (or even keep the change!). Interesting to note that I was breathalysed immediately before anything else - seems this is becoming the standard procedure when you're stopped. More and more people are being caught by mobile cameras, hand held or in the back of police vehicles (and then stopped further down the road). Parking restrictions in La Tania are being more rigorously enforced too. Still no hard evidence of average speed cameras being in use in tunnels and further confirmation that toll booth times on Autoroutes is being used to catch people is an urban myth has been received. 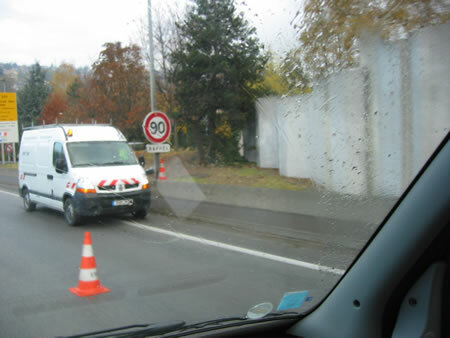 A new fixed camera has been installed on the main N90 dual carriageway between Moûtiers and Albertville. It is located near to Albertville just before the turn of to Annecy (the McDonalds turn off and main route in to Albertville Centre, Junction 30). The speed limit drops from 110km/h to 90km/h just before this - you have been warned! More and more people likely to be booking cars from the French side of Geneva airport with the state of the Swiss Franc exchange rate this Winter - likely to be a decent saving most of the time even if you don't get Winter tyres / chain included automatically (or billed to you when you get back!). Beware of fixed and mobile cameras on the motorway around the airport. Of course you may get lucky with French plates and not be chased for the money see The Fine section below. Swiss Vignette issues and avoidance of paying covered on the Hire Car / Driving Directions Page. We've reports of Police on Bozel roundabout breathalysing drivers fairly often this Summer and finally still no news (which is good news) on driving licence points being shared across Europe or French Police chasing fines back to England. Looks like only one new fixed camera on the standard airport runs but more and more reports of mobile cameras. There is now another camera on the new A41 motorway en-route to La Tania past the Cruseilles 3km tunnel and before the ticket collection Péage. 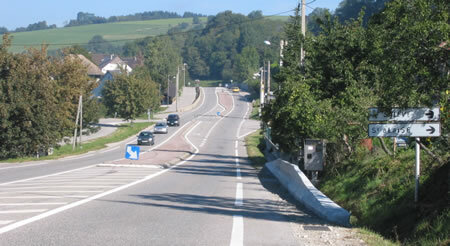 This is in addition to the fixed camera before the Annecy Nord Junction (J17) on the A41. One mobile trap to watch for is coming from Geneva on the new motorway just after the long 3km tunnel passed Cruseilles - there's a lay-by about 750m after the tunnel that we've seen used by mobile camera units. Rumours of French speeding points being put on to UK licences (or fines from fixed cameras being chased up on UK registered cars) have surfaced again - bound to happen eventually but we can't find any definitive info on this. Another 2 fixed cameras are in place on the Geneva run - between the end of Lake Annecy and Ugine (the village before getting to Albertville) in the direction heading to La Tania. There are signs warning you of them, see above so no excuses - I set both off in April 2008 around 1am - trying to get back the Ski Lodge for last orders. The hire car company did not get in touch though (they usually bill your credit card plus an admin fee). 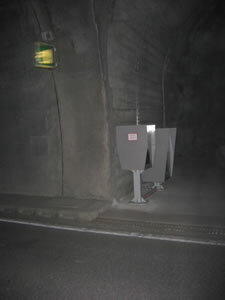 When heading from the airport to La Tania going via the town route there are two fixed cameras that are hard to spot in the dark in the urban dual carriageway section. I've set both of these off too! I was nicked by one of these in April 2008 doing 74km/h just as I passed the 50km/h restriction (early Monday morning, no one about). I was pulled over by more police further down the road and fined €95 on the spot. The paperwork took a good 15 minutes to complete with multiple forms and receipts to be issued. 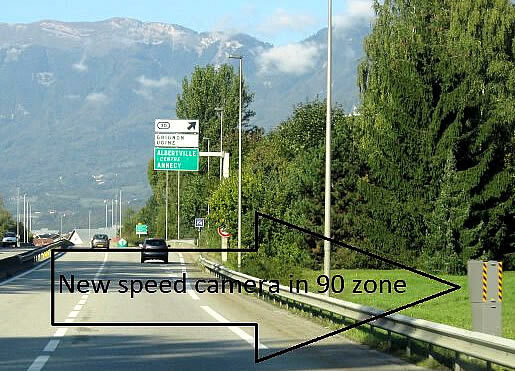 Beware of mobile cameras near McDonalds in Albertville, anywhere along Lake Annecy and all the villages where the speed limit drops straight down to 50km/h. 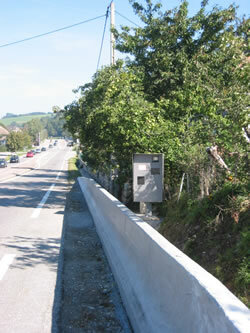 Another one being fitted near to the tunnel by Chambéry Centre - Pic here. 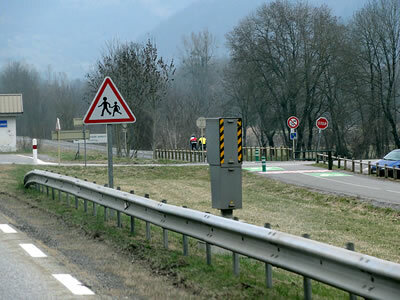 Plus a new camera between Chambéry and Albertville on the Route Nation ale N6 - Km 59.5 Crossest. Situated between Mammalian and St Pierre d' Align. It is located close to a house on the left hand side on a straight section of 90 Km/h road. Also Police using a mobile camera twice so far this season on the road down to Le Praz - Slow down! Check out the Speed Camera Map of France from radarsfixes.com YOU'VE BEEN WARNED!!! It is situated about two-thirds of the way along the tunnel just leaving Moûtiers in the direction of Albertville. It is situated on the left, hidden in a little service road (the *******! ), it will flash at anything over 89kms. Caught 46,000 offenders in it's first year. "I did the Lyon run again today and managed to get a snap of what I think is the camera in one of the Chambéry tunnels - see below, I assume its a camera, it points at the back of the cars and looks a bit like the Moûtiers one! It's in the Tunnel Sleepiness which is the 3.2km one before Chambéry coming from Lyon in a service area on the right". Mat also tells us that he was caught on the viaduct between Moûtiers and Albertville where the speed limit is reduced from 110 to 90 km/h. It appears to have some fixed point cameras along it that can record speed, Matt was pulled over by 2 motorbike cops who appeared from a side road and escorted him off - they said that he'd been done about 2km previously by a camera. So we assume they sit in the side road and have some way of monitoring the fixed cameras and can do people who zoom through the 90 bit... Unlucky Mat. This little beauty went in during August 2004, just after Cruseilles you turn left to Geneva, hit a bit of dual carriageway, floor it, come to a right hand bend (where speed limit drops to 70 km/h) and it jumps out on you - very hard to spot and impossible to slow down if you don't have advance warning. 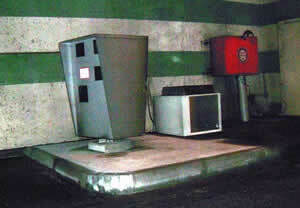 There are also some new sneaky Swiss speed cameras hidden in bollards. More on this at the excellent pistonheads website ('cos speed matters! - we couldn't agree more). Take care in the 100km/h limit between the tunnels on the way to Geneva Airport - I've been done by the cameras there, they do work! Another trick of the French police is supposedly to check times on Autoroutes between the tolls by checking your ticket time. Not sure how widespread this is, but be aware if there are police hanging around toll booths. This may be an urban myth however - does anyone have any proof this really happens? We don't know of anyone who has definitely been caught like this, although plenty of people tell the story. Note that the Reims to Calais Autoroute is a popular place for the French Police to pull over or use mobile cameras on the many UK registered cars that use this stretch of road. If only caught by a camera and no police are involved at the scene then English registered cars are very unlikely to be chased for the fine. Although rumours abound that this will happen one day. French and Swiss hire cars though beware - the hire companies simply pay the fine and charge your credit card (plus an admin fee) in most cases. I have got off with it before though and even though the hire car company supplied Swiss Police with my UK address they didn't really try too hard to get the fine off me (a couple of registered letters). There have been reports recently though that EC countries may in the future "share" there points and drivers caught in France could have points added to their licence in the UK. As of September 2011 this still does NOT happen. In May 2008 I was caught at 74km/h in a 50km/h limit. Was fined €95 on the spot (they take you to a cash point if you've no money on you by the way....) and then lots of paperwork to fill in, took about 15 minutes and with all the receipts I got it definitely wasn't going in their pocket! Some legal experts say that it would be too costly to chase the money across the channel though - that's why they resort to on the spot fines (whilst French and Swiss drivers get clean away with it in the UK).